Aroma: Poached pears and honey followed by toasted almonds and a subtle touch of cranberry. With water a coffee note appears together with chocolate orange and mellow butterscotch. Palate: Dark chocolate, cherry and Turkish delights are evident as are stewed fruits and toffee. Muscular notes of dark plum wrestle with bitter-sweet apricots and a hint of cinnamon. 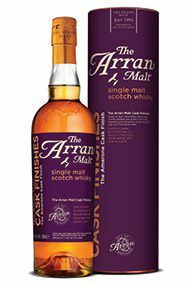 Finish: A well-balanced combination of the finesse of The Arran Malt and the restrained fruit and oak from the Amarone casks. Concentrated and elegant this malt delivers on all levels. Isle of Arran is Scotland's newest malt whisky distillery. It is based at Lochranza on the Isle of Arran, which lies off the West Coast between Ayrshire and Kintyre. Arran is a unique island known as 'Scotland in Miniature', for it has all of the scenery of Scotland, with mountains and lowlands, glens, lochs and royal castles (including one at Lochranza). Early in the 19th century there were more than 50 whisky distilleries on Arran, most of them illegal. The malt was highly-acclaimed, only rivalled by those from the 'Glen of Livet'. In 1995 Harold Currie, who was previously Managing Director of Chivas (Seagrams) and House of Campbell (Pernod Ricard), set up the distillery. The house style is creamy, leafy, with very delicate island character. Arran Single Malt 10 years old was first released in 1995 and is the flagship of the range. Lochranza is a subtle blended whisky, with the 10 years old with a high proportion of the 10 years old malt. The latest addition to the Arran range has been the 100 Proof, with the end result a greater concentration of flavours and a rich, full-bodied style. The isle of Arran has witnessed a long tradition of distilling, as well as a bitter struggle with the excise men. The legend goes that several hoards of whisky have been buried in the island from the time the local illicit distillers tried to escape the Excise men. This might be local folklore stories but the gravestones of men killed in this struggles certainly are not. In addition to the many illicit stills on the island, three licensed distilleries existed, the last of them closing in 1835. But after almost two centuries the local whisky industry has been reborn at Lochranza, with the opening of Arran Distillery in 1935 The Arran Whisky is dry and light, with hints of vanilla and fruit, a golden nectar , which is actually unpeated, atypically for an island whisky. 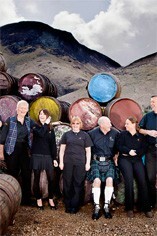 View the Arran Distillery section for a list of the whiskies.